When we delve deeper into the data, it's the major US banks which are clearly the most aggressive with ramping-up their plans to pursue outsourcing strategies. The main service-lines where they are focusing are banking-specific BPO services, application outsourcing, IT infrastructure outsourcing and Finance and accounting BPO. Insurance companies also stated a strong focus on adopting insurance-specific BPO services in a 6-12 month period. Service lines not being so aggressively pursued are primarily HR outsourcing and IT staff augmentation projects. More thoughts to follow. Many thanks to the folks at Global Services Media for their help in sending the survey to its readership. 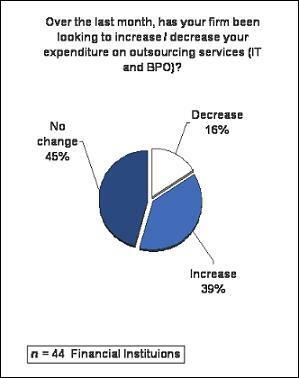 What will be interesting to see is how companies balance their desire for increased outsourcing activites with the short term need to reduce or control spending. Will companies cut back on using expert advisors (while at the same time they are laying off the very staff needed to run their internal initiatives)? Will there be increased pressure to reduce one time expenses such as transition costs? How will companies achieve this and how will outsourcing providers react? There will be pressure to avoid large transition costs moving into engagements. I predict we are going to see a number of smaller-sized engagements to begin with, in addition to a few new large global engagements where the winning providers streamline much of the initial costs over the duration of the deal.